I am a researcher between the field of network measurement using large-scale datasets, computer security and human factors in computer security (especially system administration). My current research projects include work on using DNS for security measurements, investigations of IPv6 deployment (and security), and, large-scale misconfiguration on the internet and the human factors that contribute to them. In addition to that, I also enjoy interacting with students, either in giving lectures or in supervising thesises and projects. Besides my academic interests, I am also a successful freelance system and network engineer, experienced in improving the maintainability, security, and resillience of complex infrastructures. Constanze Dietrich, Katharina Krombholz, Kevin Borgolte, Tobias Fiebig, ACM Conference on Computer and Communications Security (CCS), 2018. Tobias Fiebig, Franziska Lichtblau, Florian Streibelt, Thorben Krüger, Pieter Lexis, Randy Bush, Anja Feldmann, Cybersecurity Best Practices, Springer. Kevin Borgolte, Shuang Hao, Tobias Fiebig, Giovanni Vigna, IEEE Symposium on Security&Privacy (Oakland), 2018. Kashyap Thimmaraju, Bhargava Shastry, Tobias Fiebig, Felicitas Hetzelt, Jean-Pierre Seifert, Anja Feldmann, Stefan Schmid, ACM Symposium on SDN Research (SOSR), 2018. Tobias Fiebig, Kevin Borgolte, Shuang Hao, Christopher Kruegel, Giovanni Vigna, Anja Feldmann, Passive and Active Measurement Conference (PAM), 2018. Kevin Borgolte, Tobias Fiebig, Shuang Hao, Christopher Kruegel, Giovanni Vigna, Network and Distributed System Security Symposium (NDSS), 2018. Kashyap Thimmaraju, Bhargava Shastry, Tobias Fiebig, Felicitas Hetzelt, Jean-Pierre Seifert, Anja Feldmann, Stefan Schmid, ACM Cloud Computing Security Workshop (CCSW), 2017. Bhargava Shastry, Markus Leutner, Tobias Fiebig, Kashyap Thimmaraju, Fabian Yamaguchi, Konrad Rieck, Stefan Schmid, Jean-Pierre Seifert, Anja Feldmann, Conference on Research in Attacks, Intrusions and Defenses (RAID), 2017. Tobias Fiebig, Kevin Borgolte, Shuang Hao, Christopher Kruegel, Giovanni Vigna, Passive and Active Measurement Conference (PAM), 2017. Tobias Fiebig, Anja Feldmann, Matthias Petschick, SafeConfig'16, CCS Workshops. Tobias Fiebig, Franziska Lichtblau, Florian Streibelt, Thorben Krüger, Pieter Lexis, Randy Bush, Anja Feldmann, Technical Report, arXiv:1610.05531. Lydia Kraus, Tobias Fiebig, Viktor Miruchna, Sebastian Möller, Asaf Shabtai, MOST 2015, S&P Workshops. Tobias Fiebig, Janis Danisevski, Marta Piekarska, CSET 2014, USENIX Security Workshops. Tobias Fiebig, Jan Krissler, Ronny Hänsch, WOOT 2014, USENIX Security Workshops. Creating usable End-to-End encryption implementations, securing day-to-day communications without relying on central infrastructure (PKI). Responsible for the TU Berlin portions of the proposal; conceptualization, application, budgeting and integration among the partners. Research Group of Prof. Christopher Kruegel and Prof. Giovanni Vigna, Research on Internet-scale measurements of DNS misconfiguration. Research Group of Prof. Anja Feldmann, Ph. D, Research on Internet measurement, human factors in security and Internet-scale security misconfiguration. Research Group of Prof. Dr. Jean-Pierre Seifert, Research on mobile security, security of financial transaction security models, and Internet-scale security misconfiguration. Constanze Dietrich, "Human Factors as Security Risks in IT Operations: An Empirical Evaluation of Operators' Experiences with Security Misconfigurations", Examiners: Tobias Fiebig, Ilse Schmiedecke, Prof. Dr. Agathe Merceron. Advised by Prof. Feldmann together with Prof. Seifert. Thesis Title: An Empirical Evaluation of Misonfiguration in Internet Services. Majors: Cognitive Psychology, Philosophy of Mind, Artificial Intelligence, Computational Linguistics and Computer Science, Grade: Very Good. Internet Engineering Task Force (IETF) Meeting No. 98, Chicago, Presenting first steps towards scanning IPv6 globally in an industry context, with a special focus on transferring academic insights to industry players. 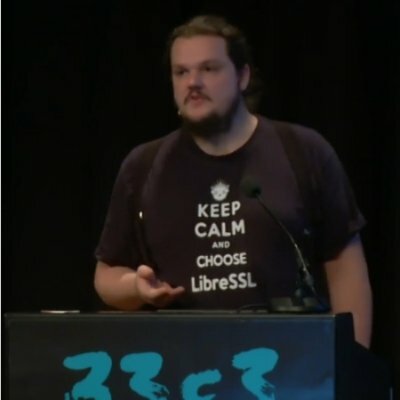 33C3: 33rd Chaos Communication Congress, Hamburg, Presenting first steps towards scanning IPv6 globally. Ringkolloquium: Digitale Herausforderungen, Berlin, Presenting on operations personell as overlooked part of security and usability research. 20. Kryptotag der Gesellschaft für Informatik, Berlin, Using hardware reverse engineering as a tool to teach high-school students about computer science. Seminar for the "Union of the Police" (Gewerkschaft der Polizei, GdP) on "Cybercrime"
Lecture during the Symposium of the "Union of the Police" (Gewerkschaft der Polizei, GdP) on "Cybercrime"